7” vinyl EP (45 rpm) with picture sleeve. Numbered edition, strictly limited to 500 copies, worldwide. Direct Metal Mastering, manufactured by Pallas. • Four classic Western songs from the golden era of Western movies. • A vinyl single in legendary EP-size: 45 RPM, four titles – and a picture sleeve! • Includes Johnny Cash’s vocal version of the ‚Bonanza’-theme tune. • With Lee Marvin’s notorious vocal debut Wandrin’ Star! 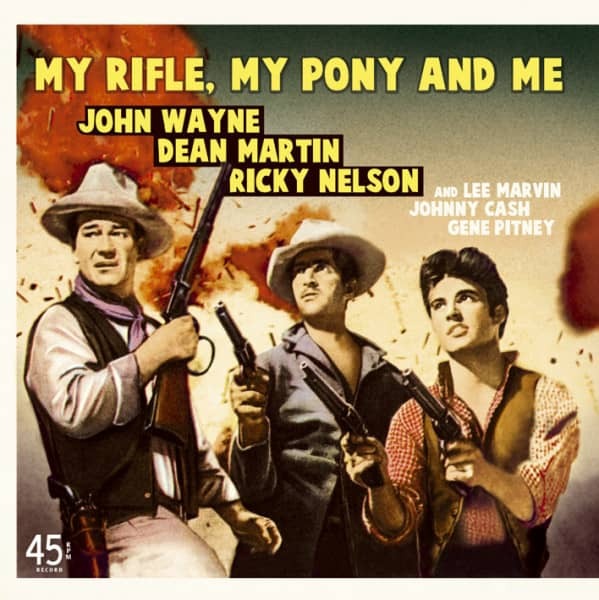 „We’ll have western films as long as the cameras keep turning“ said John Wayne – and the Duke personally presents Dean Martin and Ricky Nelson singing My Rifle, My Pony And Me from ‚Rio Bravo’. There is a long tradition of movie themes sung by contemporary Pop or Country singers: Frankie Laine and Roy Rogers, Marty Robbins, Eddy Arnold and Willie Nelson – they all interpreted the themes from Western movies and TV series. And actors such as Clint Eastwood or Kirk Douglas also made some (more or less convincing) attempts as singers. Here Bear Family presents – for the first time on vinyl since decades – an exceptional collectors item: the theme tunes from three Western classics (‚Rio Bravo’, ‚Paint Your Wagon’ and ‚Bonanza’) plus Gene Pitney’s ballad about 'The Man Who Shot Liberty Valance', inspired by the movie of the same name featuring James Stewart. Customer evaluation for "My Rifle, My Pony And Me, Wand’rin’ Star b-w Bonanza, The Man Who Shot Liberty Valance"